« What should I pray about? SYDNEY — A new poll released Monday indicated that more than 40 percent of Australians think China will become a military threat in the coming decades. The annual study from the independent research organization, the Lowy Institute, also finds that many Australians believe their government is allowing too much Chinese investment. Despite these fears, the poll also shows that Australians say they appreciate how important trade is with China. Alex Oliver, a research fellow at the Lowy Institute, says despite a lucrative trade relationship, there is mistrust in Australia towards China. “The majority of Australians say the Australian government allows too much investment from China, and a significant minority, and this is really interesting given that China is now Australia’s largest trading partner, think that China is likely to become a military threat to Australia in the next 20 years. So that is a wary relationship, it is an ambivalent relationship and it is going to be complicated for any government to resolve,” said Oliver. Around 1,000 people were quizzed by the Lowy Institute about their attitudes to foreign policy and other countries. More than 60 percent of respondents say they believe China will eventually replace the United States as the world’s leading superpower, while 12 percent say it already has. According to the poll, the long-standing military alliance with the U.S. remains Australia’s most significant international relationship. Well, some in Australia are starting to realize a threat I have warned about for some time. Yet, it should be more than 40%. Certain biblical, Chinese, and other prophecies, mentioned in the Arroyo Grande, California published book 2012 and the Rise of the Secret Sect, discuss that how Australia itself may become taken over. By virtue of her timing, Julia Gillard may inadvertently pursue policies that will lead to the fulfillment of various end time prophecies. 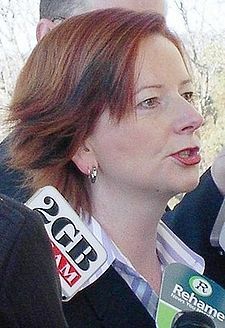 Her role as Australia’s new prime minister will have prophetic ramifications. This may be related to a deal that perhaps the Chinese will make in the future with Europe, as opposed to military conquest. It also may not be related to the taking of Australia or New Zealand, but perhaps might be. This Chinese prophecy, combined with Bible prophecy and recent developments, should be of concern to those living in Australia or New Zealand. China may be granted lands like Australia in partial repayment for the debts that the U.S.A. owes it, as well as in full payment for any debts Europe itself may incur with China (it is likely that China will loan money and/or increase investments in Europe). It is also possible that a country like Japan may get some Anglo-dominated land (New Zealand comes to mind) in partial repayment for the debts that the U.S.A. owes it (and also possibly Europe) since the King of the North will divide land for gain. The presence of US troops in China may be used as part of its possible future justification for taking the land of Australia. The Chinese may claim something to the effect that Australia is really a military pawn/representative of the USA…The implication for Australia is more than profound–the implications are disastrous. The Australians themselves hope that the USA will be able to protect them. Yet, the presence of US troops in China may be used as part of its possible future justification for taking the land of Australia. The Chinese may claim something to the effect that Australia is really a military pawn/representative of the USA and thus, since the USA owes them money, taking over Australia will help settle that debt. China is rising up and the USA is declining militarily relative to it as well as to Europe right now. This does not bode well for the USA nor its allies like Australia. The implication for Australia is more than profound–the implications are disastrous. Without national repentance, the nation of Australia is doomed. Period. Many do not wish to accept that, either here in the USA, over in New Zealand, or in Australia, but it is the truth. These nations will be taken over, and it may be that China will control part of the land. This century will be the final “time of the Gentiles,” though it will be for a while led by Europe and not the Chinese (see also A Is China THE Threat to the United States of America? and Can You Prove that the Beast to Come is European?). This entry was posted on Monday, June 24th, 2013 at 6:01 am	and is filed under COG News, Prophecy.